Get ahead of your competition. 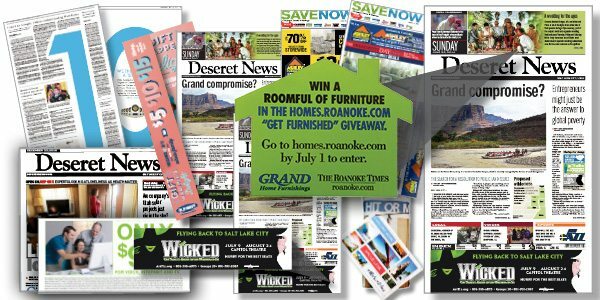 With premium products, Utah Media Group offers advertisers a unique opportunity to attract the attention of readers, in many cases, before they even open the paper. With a variety of options, advertisers can choose between many premium options such as Creative Ads, Save Now, Front Banner Ads, Spadeas, Die Cut Sticker Notes, Belly Wraps and Tag Alongs. Creative Ads: Capture the attention and curiosity of our readers with unexpected and unique Creative Ads. These ads are wrapped by newspaper text making them prominent and visible. Save Now: Save Now is a shared mail piece that is distributed to readers every Sunday and to more than 370,000 non-subscriber homes throughout the valley every Monday. Extend your reach to and beyond newspaper subscribers. Front Banner Ad: Reach more consumers by appearing on the front page of your preferred section in the Deseret News and The Salt Lake Tribune. Your message will reach more than 299,946 daily readers and 412,818 Sunday readers. Spadea: Wrap the front section of the Deseret News and The Salt Lake Tribune with a premium spadea. A spadea is a full page broadsheet that is folded to wrap a section of the newspaper. It is the first thing readers see before opening the paper. Die Cut Sticker Note: Die Cut Sticker Notes can be positioned on the front pages of the Deseret News, The Salt Lake Tribune, daily feature sections, Money Bags (Sunday Select) and Save Now (shared mail). Get your message across with relevant die-cut shapes such as tags, houses, and busses. Belly Wrap: A Belly Wrap wraps the entire newspaper. Be the first ad readers see as they receive their newspapers! Tag Along: A Tag Along is an ad that ties around rolled newspapers like a rubber band. Engage readers by interacting with your ad before they open the newspaper. © 2019 Utah Media Group. All Rights Reserved.